Climbed into my 16ft lock on this morning about 15 minutes before daylight. Had very wet conditions since its been raining here for 2 days. I thought it might be a good time to be in the stand with the front moving out and colder air moving in. I was hunting in mixed pine and hardwood and with every thing drenched the squirrels were even hard to here directly below me. This area has proven itself over the years, with an edge created by timber and a now 5 year old cutover used as a bedding area. Scrapes line this edge for 100 plus yards, and even with all the rain you could smell the sweet musky aroma of the hot scrapes from my stand. I had seen a cowhorn and a six point from this stand this past Saturday. Neither presented and acceptable opportunity. This day would be different. 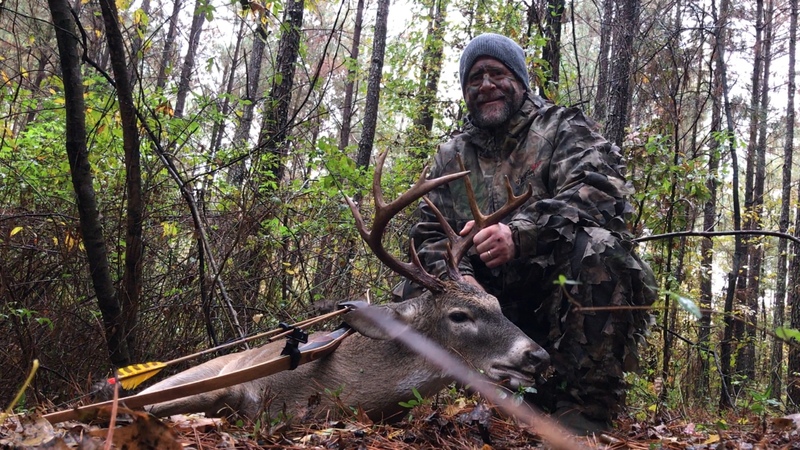 At 0650 i let a small basket rack six point slip pass me as i was focusing my attention directly behind me. As i turned foward he was already well out of range and just entering the cutover. I provided a couple of soft grunts to which he paid little concern except to stop and look my direction and continue on. About 15 minutes later i thought i kept hearing what i thought were heavy footed steps from my left. Standing with my Toelke whip resting on my boot i talked myself out of believing it was anything more than a squirrel. My head on a swivel i continually surveyed. A min or two past and i looked back over my left shoulder where i had been hearing the dismissed sound. To my shock I see a slab of deer hide appox 10 yards, ghostfully moving my way. The beauty was absolutely silent as he moved closer. I had a shot at this point as he took a pause at 4 yards, but of course it was the dreaded straight down headon situation. What felt like an eternity the buck stood motionless. Fearing he would smell me if he continued to get closer to my treesteps, i committed to shoot if i got only a small window of opprtunity. He just needed to turn, and thats what he did. Turning to his right, he slowly began walking behind me providing a hard quartering away shot. I quickly looked ahead and had a small window to get through the few branches in the way, beyond that i would have no shot. As he entered the spot I drew settled and released. He Stumbled hard as he shot out and almost fell two more times as he ran out of sight. I gave him all the time i could stand and got down to observe where he was standing. 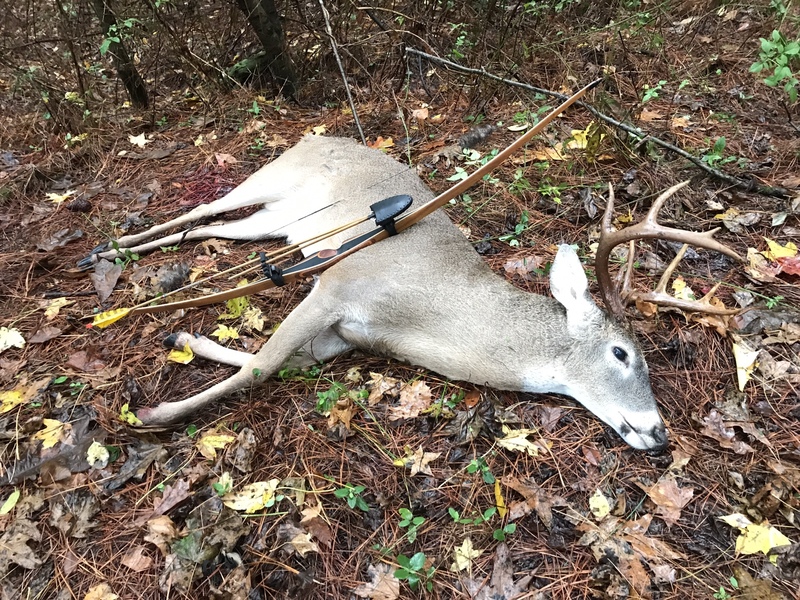 To my relief I found 16" of my arrow, broadhead buried in the dirt. It was a great blood trail for 90 yards before he died. Autopsy revealed the arrow entered behind the left ribs and exited in the lower brisket/chest. Beautiful buck, great shot, and awesome story!